There’s a decent chance my tonsils are coming out in 2016. In addition to worrying about the pain, time, and expense, one thing has weighed heavily on my mind: Do I continue to watch The Mindy Project or do I save it up for a media marathon following surgery? Interviews with marathoners tell me I’m not alone in reaching for an engaging story during a health struggle. 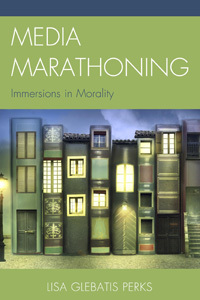 Participants in the studies for Media Marathoning: Immersions in Morality volunteered various health-related motives for marathoning. 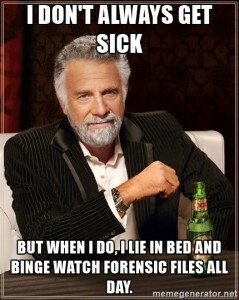 I’m now doing a study focused solely on the role marathoning plays in coping with or recovering from a health setback. I am seeking a dozen interviewees (ages 18 and older) for this new study about experiences media marathoning* during health troubles, including colds and viruses, mental illnesses, surgeries, injuries, pregnancy complications, debilitating reactions to medications, and other challenges. No health-related questions will be asked. If you have media marathoned in the last 24 months when you were not feeling well and could not complete your usual daily activities (such as going to work, care-giving, or going to school), you qualify for the study. Please contact me at perksl@merrimack.edu if you think you fit the study criteria and you have time for a phone interview lasting approximately 30 minutes. All participants receive a $10 Amazon gift card. Thank you for considering participating in this research that can help us better understand the relationship between media marathoning and coping.